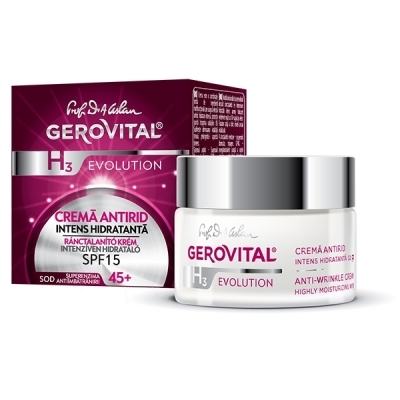 The Regenerating Lotion with Petroleum is an innovative product that strengthens the structure of the hair strand. It is highly recommended for all hair types and it should be applied as prevention or at the first signs of devitalization of your hair strand, in order to avoid an increased falling rate of the hair. The Petroleum Regenerating Hair Lotion fights against hair fall, it stimulates its healthy growth due do the rich Vitamin A and Vitamin C complex. The active principles within the Petroleum Regenerating Hair Lotion stimulate the bloodstream level on the scalp supporting the hair growthprocess. Based upon the level of degradation of your hair, apply locally the Regenerating Lotion with Petroleum treatment, once or twice a week, for 3-4 months. The lotion should be applied with the help of a cotton pad on the scalp and on the length of the hair. It should be massaged and left to action for about 3-4 hours. 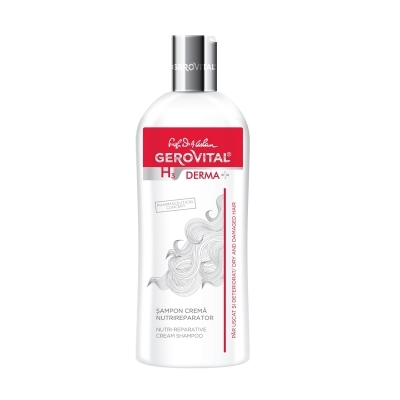 Wash well afterward with the Gerovital Regenerating Shampoo, then spray on with the the Serum for Split Hair Ends. The active principles of this unisex shampoo that grows hair act upon the basic components of the hair structure, from the roots to the ends. The regenerating shampoo represents the first step for you to enjoy a clean, silky and healthy hair again. With a guaranteed action, because of the hydrolyzed Keratin and the 5 natural extracts (Burdock, Horsetail, Birch, Rosemary and Sage), the product revitalizes the tired hair and fights against the excessive hair loss, answering the question of how to grow thicker hair . Apply the shampoo on the scalp and massage gently, for stimulation and tonifying action, for about 1 minute, then rinse well. Repeat if necessary. 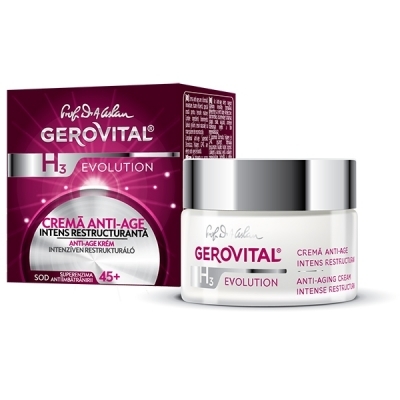 Once a week supplement the Keratin and Provitamin B5 by applying the Mask for Degraded Hair from the same Gerovital Hair Line. 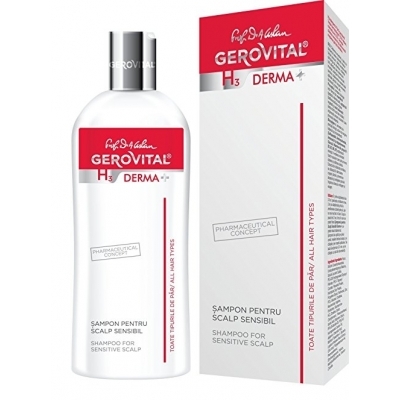 The 5 natural extracts of the Gerovital shampoo (Burdock, Horsetail, Birch, Rosemary and Sage), enriched by the hydrolysed keratin, help hair to regain its vitality, from the roots to the ends and prevent hair loss. 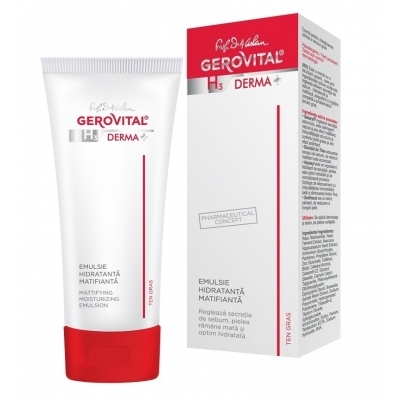 This Gerovital mask is a very welcomed and reliable solution for hair predisposed to daily aggressions, such as chemical compounds from the styling products, high temperatures (hair dryer, hair straightener), UV rays, environmental pollution, etc. Does your hair lack of vitality lately? Spoil it by applying this intensive nourishing hair mask in order to restore the damaged and fragile hair strand. The nourishing and revitalizing ingredients penetrate the hair strand without damaging it. As a result, you will regain the pleasure to pass your fingers through your healthy and silky hair. If used after every wash, or at least once a week, on the freshly washed hair (with the Gerovital Plant – Regenerating Shampoo), the mask will help the hair to regain its elasticity, vitality and shiny look. This treatment for damaged hair helps you by reestablishing the natural balance of the healthy hair. Leave it to action for a few minutes and rinse well afterwards. Do not rush, you have all the time in the world to be beautiful.Used after each wash, the hair regains its elasticity, vitality, becomes easy to comb, shiny, with a healthy aspect. Do you have long hair or you want to grow hair longer? Cure it from the roots to the ends! How to get longer hair? 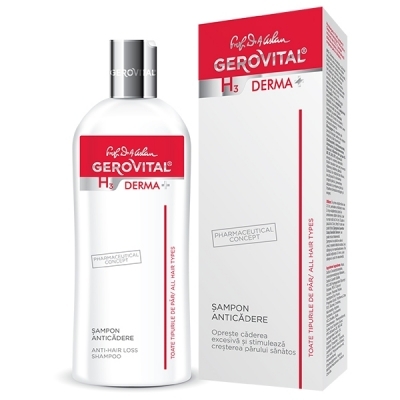 This Gerovital Plant Hair serum softens the hair strands, it hydrates the dry ends and it repairs the damaged ones. More than that, if regularly applied, the product nourishes and fortifies the hair, by giving it back a healthy aspect. Spray the serum from half of the hair strand down. Apply it on wet, freshly washed hair, without rinsing. 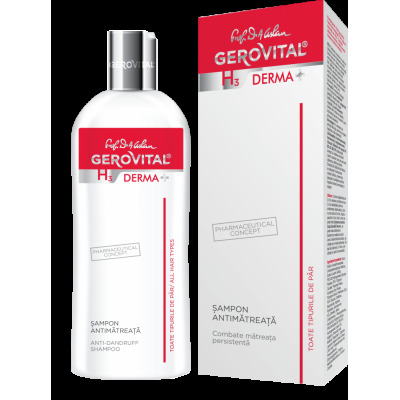 We recommend the use together with the Regenerating Shampoo and Antidandruff Shampoo from the Gerovital Plant Hair line. Even if you may think your hair is healthy, the ends of the hair strand are being rubbed daily and continuously to the clothes, creating damages to the strand. Apply preventively this serum and strengthen the ends of the hair strand. 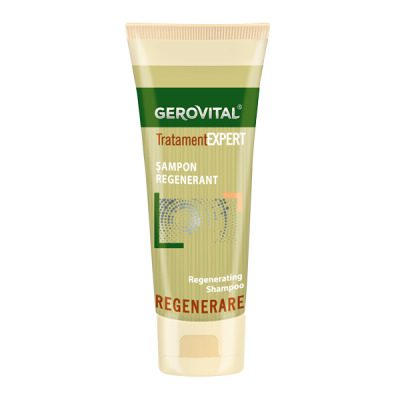 This unisex Gerovital Plant Hair Regeneration Treatment Kit is an amazing hair care innovative product (for external use) which restructures, treats and restores the hair with no vitality, prevents hair loss, and improves the dry or excessively greasy scalp. The Hair Regeneration Treatment Kit contains the Vitamin A, Vitamin B5 and Vitamin E the natural way to restructure the degraded hair.he formula acts through the Vegetal Extracts with proven efficacy in stimulating the healthy growth of the hair strand and prevention of hair loss. The ultimate exquisite nature inspired compound, the Quaternized Hydrolyzed Keratin, which rebuilds the structure of the hair, gives shine, protection and strengthens the breakage resistance is a key ingredient of the Hair Regeneration Treatment Kit formula. 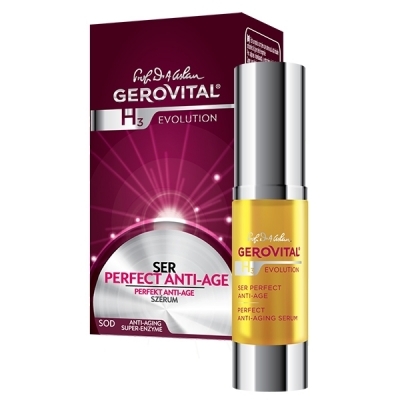 The active principles of the concentrated formulas of the two serums within the Hair Regeneration Treatment Kit combine and act in perfect synergy in order to: improve the circulation at the capillary level, normalize the secretion of the sebaceous glands, prevent the loss of hair and stimulate the healthy growth of the hair strand. Mix the contents of the Vial 1 and Vial 2 in a container, until you will obtain a creamy consistency. Apply the obtained composition on wet hair both on the length and scalp, and massage. Leave it on for 10 minutes and rinse well afterwards. The Hair Regeneration Treatment Kit should be applied twice a week. For higher efficiency the Hair Regeneration Treatment Kit is recommended a minimum 2 months period of treatment. The Moisturizing Thermo-Protective Serum protects the hair against the extreme temperatures of styling machines. As the hair becomes dry, split, frail, looking unhealthy and damaged because of use of different cosmetic products and cosmetic electronics, this formula based on Keratin and D-Panthenol is a great ally for hair hydration and reconstruction, therefore a great treatment for dry hair. The action principle of this Moisturizing Thermo-Protective Serum is based on the low conductivity of protecting film it creates around the hair. As a results, the moisturizing level of hair becomes imune to the use of the hairdryer, curling iron, heating plaque and weather conditions as high temperatures and UV radiations. How to make hair healthy: Apply the Moisturizing Thermo-Protective Serum on the hair after each wash.
Leave the Moisturizing Thermo-Protective Serum, a dry hair treatment, to action for 2-3 minutes in order for the Panthenol and Keratin to fix, necessary for hydration and reconstruction. Do not rinse! Once the Moisturizing Thermo-Protective Serum is applied, use the dryer/styling apparatus, making growing healthy hair. You can see how your hair loses its volume day by day, and each new day is a real challenge to try and find anti hair loss solutions? 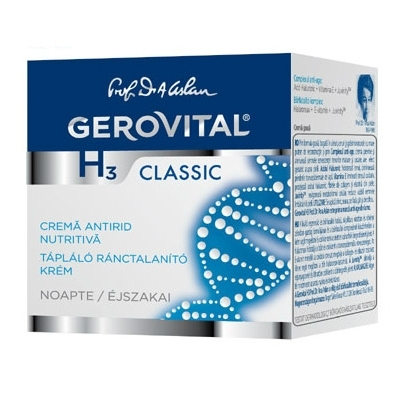 Gerovital experts recommend the products of the range, Gerovital Expert Treatment Anti Hair Loss, with essential ingredients that contribute to the fortification of the root of the hair, stimulating a healthy growth and rendering a shiny aspect. The Anti-Hair Loss Serum improves the hair and scalp condition, leaving hair strengthened and nourished, in turn reducing further loss of hair. Moisturizing conditioner with special active ingredients that act on the whole length of the hair from root to tip, generating a great & healthy look. Copyright 2018 - Romanian Gerovital - All right reserved.